Dell works in a large office. She is good at her job but not as confident as she would like to be. Out of the blue she receives an email from her supervisor, Marge, a rather bossy person who reminds Dell of her own mother. Marge’s email instructs Dell “ Please see me in my office, immediately”. Dell is instantly frozen with fear. She is sure that she is in trouble but has no idea what it is about. Dell’s emotional age has slipped right back into the Pink sector. She is feeling helpless, afraid and powerless. She is anticipating a difficult and scary meeting. Dell in her panic forgets all about the emotional age work she has been doing. She knows that she “has to” go to see Marge but as she enters Marge’s office, her body language is projecting fear. Dell thinks this is probably what Marge likes her staff to feel. Dell panics for about 30 seconds. Quickly, she remembers this is a very good time to look at her coloured emotional age coffee mug which she keeps on her desk. She can see then how she had slipped right back into her Pink sector. As soon as she sees she is on her way out of her very young and very vulnerable PINK place. Dell moves into (and then out of) her young, needy orange “I have to...” sector, skips her red Fighter-Survivor and keeps moving herself around her wheel until she is safely in her dark green thinking-fixer sector. There she is able to remind herself that facing up to Marge is definitely “grown-up’s work” and must not be left to any of her younger PYRO protector parts. As she prepares to go to see Marge she is already moving into her bright green sensible middle STAR sector and feeling calmer. By the time she enters Marge’s office she is feeling even more Aware and Grown-up (she is safely inside her blue WING zone). She has a smile on her face. Her voice and her body language project her positive energy and Marge can’t help noticing it. Marge explains that she is very pleased with Dell’s work and is offering her a chance to take over the work of a more senior officer on a trial basis. 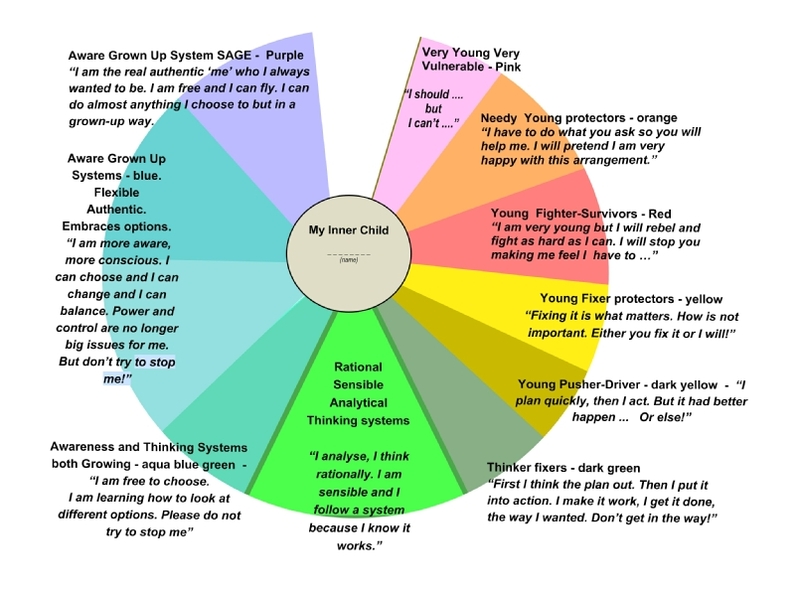 Note: Notice how as soon as Dell looked at her EA Color Wheel she immediately started feeling stronger, more confident and less stuck. She could move. This is the simple secret of the EA wheel. No matter how stuck you feel, looking at the wheel gives you the power to move. The part of you that looks at the wheel is always stronger and more aware than the parts that felt too vulnerable or stuck in a vulnerable place. As she moved into her WING zone Dell felt even more integrated more balanced and more grown up. That gave her the ability to project a more grown-up and more positive energy. Marge could not help noticing and this helped her to respond to Dell in a friendly and positive way. When you do this, people respond in more positive ways. This case is based on a true experience, adapted and used with permission. The real Dell helped me to develop the first EA Color Wheel two years ago and was one of the first people to have her own Color Wheel coffee mug which she tells me she looks at every day. 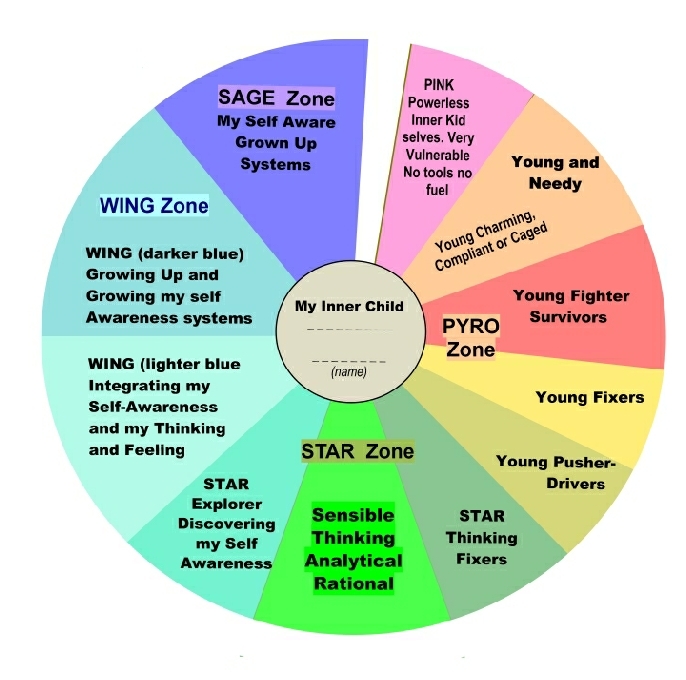 If a person finds them self getting stuck too often in too much very young energy it is more than likely that this pattern is directly related to negative early childhood experiences.